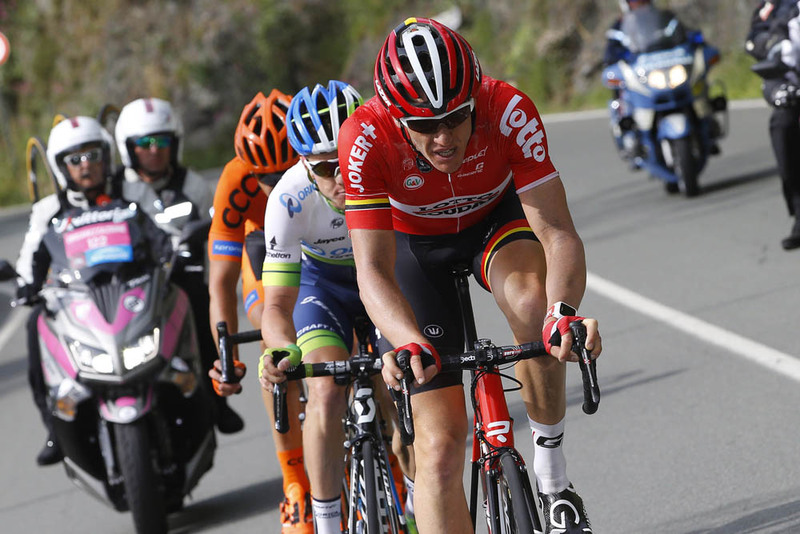 Australian Adam Hansen (Lotto-Soudal) is approaching a Grand Tour record of 11 straight rides… whether he likes it or not. Lotto-Soudal fields him in the three-week races to help sprinter André Greipel and overall contender Jurgen Van den Broeck. Along the way, he has won stages and made a name for himself in the record books. Hansen’s first Grand Tour was the 2007 Giro d’Italia, but his run of consecutive rides began with the 2011 Vuelta a España. Since then, the 34-year-old has ridden and completed every Grand Tour: the Giro d’Italia, the Tour de France and the Vuelta a España. Spaniard Marino Lejarreta set the record of 10 straight Grand Tours in the 1990s. Hansen completed 10 with the Vuelta last year and now is on number 11. The only catch: he discovered that Spaniard Bernardo Ruiz rode 12 in a row in the 1950s, but then the Vuelta was only two weeks long – not exactly a ‘Grand’ Tour. “I looked into it, it’s true, but the Vuelta was only two weeks,” Hansen added. “The record for the most Grand Tours is 10, so I don’t know, I’ll just keep going. He hardly has time to think about his history, he just gets on with his job. Hansen won the rain-soaked stage to Pescara in the 2013 Giro d’Italia when Bradley Wiggins was slipping and sliding over the roads. In last year’s Vuelta, he escaped to win in Cangas de Morrazo. He never thought he would be approaching a record. “I remember when I was on number five at the Tour, someone said, ‘You should go for the record.’ I said, ‘That’s not possible, for sure I’d crash out.’ They told me not to talk like that, but then that’s just reality,” Hansen said. “You do 13 Grand Tours in a row without crashing, you have to be super lucky. For me, I just expect it. If I crash out and don’t make the record, what can I do? I made 10. I’ve been lucky. Of course, I don’t take risks on the crazy descents.